I’ve been experimenting with some new nail art decorations lately. I thought these teardrop rhinestones were pretty cool, so I thought I’d give them a try. They were actually a bit bigger than I’d anticipated – I have pretty large nails, and they are too big to fit on my pinky nail – but I still think they’re really cool. They definitely have the potential to compliment some pretty nail art or made more edgy. It honestly took me forever to come up with what I wanted to do with these, but I ultimately decided to play up the iridescent flakes that are inside them. I started by painting my nails using Pretty & Polished Prism Break, which is a clear polish with small iridescent flakes in a rainbow of colors. Then I used Butter London Brass Monkey to add a bit more sparkle just on the tips. The flakes in Brass Monkey are bigger and thicker and lean toward the gold side. Then I attached the rhinestones just using some topcoat since I didn’t plan to wear these very long. Nail glue might be the way to go with these, because they’re completely flat on the bottom so they do stick up a bit where my nails curve. I was a bit worried they’d catch on something, but I didn’t wear them long enough to find out. I do think these are really pretty, but I wish they were smaller or at least curved on the bottom. I think they’d make a really edgy accent to some black nails, too, so I might try that later. You can pick these up from Born Pretty Store by clicking here (they also come in white, which looks gorgeous!). 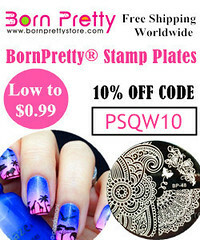 And don’t forget to use code PSQW10 for 10% of your Born Pretty Store order! Let me know what you get in the comments! I’ve been a bit uninspired lately when it comes to nail art, so I decided to branch out a bit and ended up getting these turquoise cabochon studs. I think they are gorgeous, and I love how these nails turned out! I used OPI Black Onyx as a base for these nails. The turquoise studs and round silver studs are actually both from Born Pretty Store. I just attached them with using a coat of topcoat. I used a wax pencil (also from Born Pretty Store) to pick up and place the stones. I’ve been using it for a while in my nail art, and I have to say: it is sooo much better than tweezers or a dotting tool! If you use any kind of nail embellishments, I’d highly recommend getting one because it makes placing stones or studs a breeze! If you’re interested in the turquoise studs, you can purchase them here (they come in a wheel with three different shapes and four different colors). The round silver studs (which also come with gold ones) can be found here. And you can get the wax pencil here (I’ve tried both kinds on the Born Pretty Store Website, and while they’re both good, I prefer this one, which has a softer, clear wax). I was in the mood for something super colorful, and ended up with this design inspired by fiesta party decorations (at least in my head). They’re kind of tribal, kind of cutesy, but definitely colorful. They didn’t turn out exactly how I envisioned them, but I still really like them. I started all the nails with a base of Cult Cosmetics Redondo Beach, which is a gorgeous nearly neon red. Then I painted on the stripes with Cult Cosmetics Newport Beach, Cult Cosmetics Playa del Rey, Cult Cosmetics Point Dune, OPI Good Grief!, and OPI My Boyfriend Scales Walls. These looked awesome from a normal distance (read: not HD close-up photos). I kept staring at my nails all day! Usually I prefer horizontal stripes, but I love how the vertical works here. P.S. In case you missed the announcement in my last post: I officially have a Born Pretty Store discount code exclusively for my readers! Use code PSQW10 to get 10% off of anything at bornprettystore.com! They have tons of great stuff – from stamping plates and polish to studs and rhinestones of all shapes and colors. I’ve been buying nail art supplies from them since I started this blog over three years ago.